Sometimes the simplest things are by far and away the best. While in France, I pretty much looted E Leclerc (why are French supermarkets so much better than UK ones?) and, having missed market day in the village, came away with allsorts of gorgeous vegetables including some courgettes and aubergines. This takes no more than 5 minutes to prepare and about the same amount of time to cook, so is perfect for all the lazybones out there. I served it alongside a selection of salads. Slice the courgettes and aubergine into 5mm slices (the thinner the better, but not so thin that they're like paper). Place the griddle on the hob and turn the heat up. 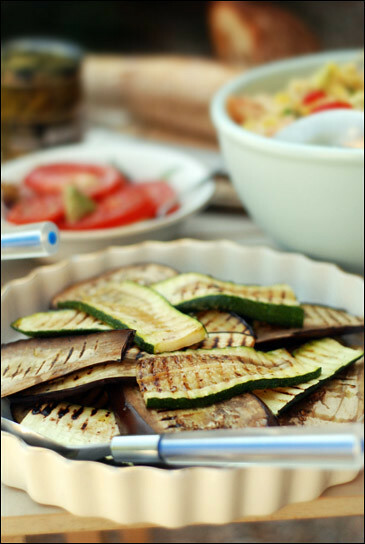 Allow it to get really hot, then place as many courgettes and aubergines as you can comfortably fit onto the griddle. Flip over after a couple of minutes (there should be lovely scorched ridges on the cooked side) and then repeat until all the courgettes and aubergines are cooked. Season with salt and pepper then drizzle with olive oil or the vinaigrette I previously blogged for a more full-flavoured dish. Delicious. I swear I could eat courgettes with anything. Must buy a griddle! michelle, i must too! we only have one in france and i'm missing it enormously. these are the best. fact. i adore courgettes!